Learn the art of beautiful writing. This class will focus on the Uncial Script. 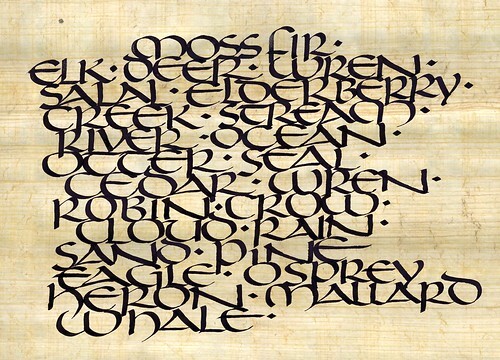 Originally developed in the 4th & 5th centuries, Uncial looks both classic and modern. This script is fairly easy to learn and can be used for informal signage, quotations and seasonal greeting cards. Students will write with traditional edged pens using ink on a variety of papers. We will cover tools and materials, history of lettering, basic design principals, experimental techniques and make a small sewn book. NOTE: If you are a continuing student, just bring any tools and supplies that you already have. You do not need to buy anything new.